Well, I finally have some time. I have disconnected the traction battery (under the driver's seat) and I have accessed the charger, from the trunk, without removing it from the car. Above the charger there is a small box (doghouse?) and everything seems normal. There is a fuse, but it is OK.
Accessing the interior of the magazine has been difficult, the cover seemed sealed / glued. 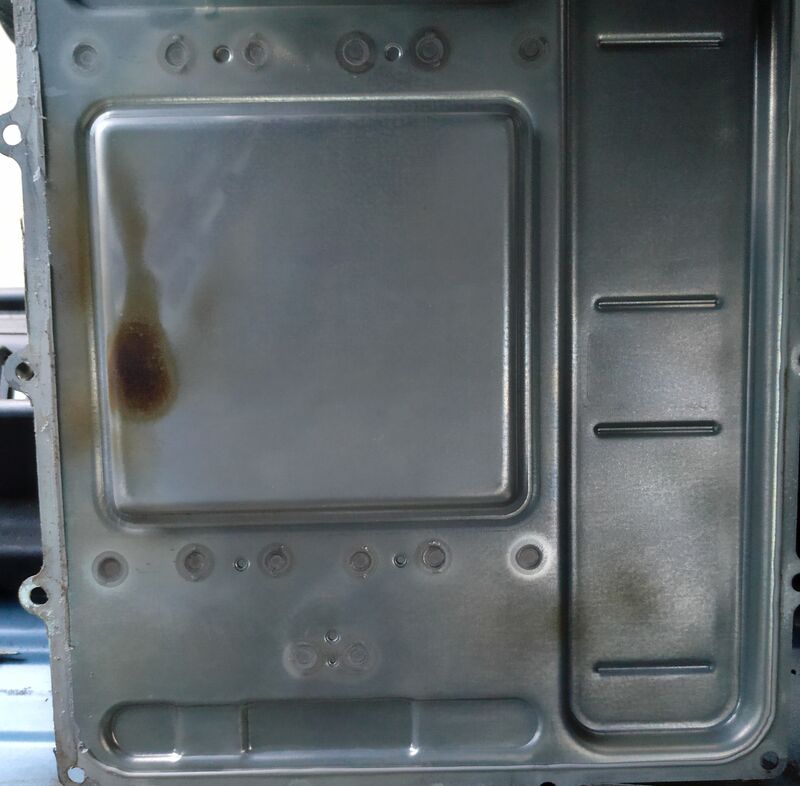 When I finally lifted the cover I got a familiar smell of burned electronics. The cover seemed somewhat toasted by the area on the wiring / coils. Again, there is a fuse, it seems to be OK. The large condenser on the left has a color that is a bit more toasted than the other two. 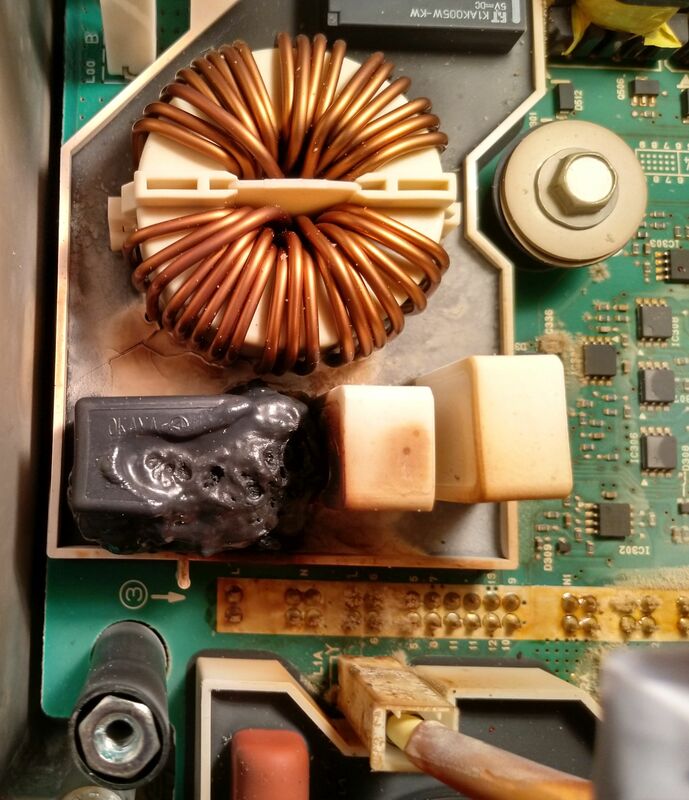 I remove the small top board, and I find visible damage, there is something melted. ¿Ideas? What has been burned? Next step? Let's put this little ball on the road again! Thank you all! Barbagris wrote: The cover seemed somewhat toasted by the area on the wiring / coils. Yeah, the charrgers run really hot. That's unfortunately normal, or at least usual. It will probably survive, but would be good to replace if it's not a whole lot of trouble. There's your problem It will be the 2.2 μF capacitor, shown in this schematic (available from the index on the first page). Problem is, it might be melted due to heat from the pre-charge resistors, which are looking a bit toasty. It seems to be melted from the -re-charge resistor side. 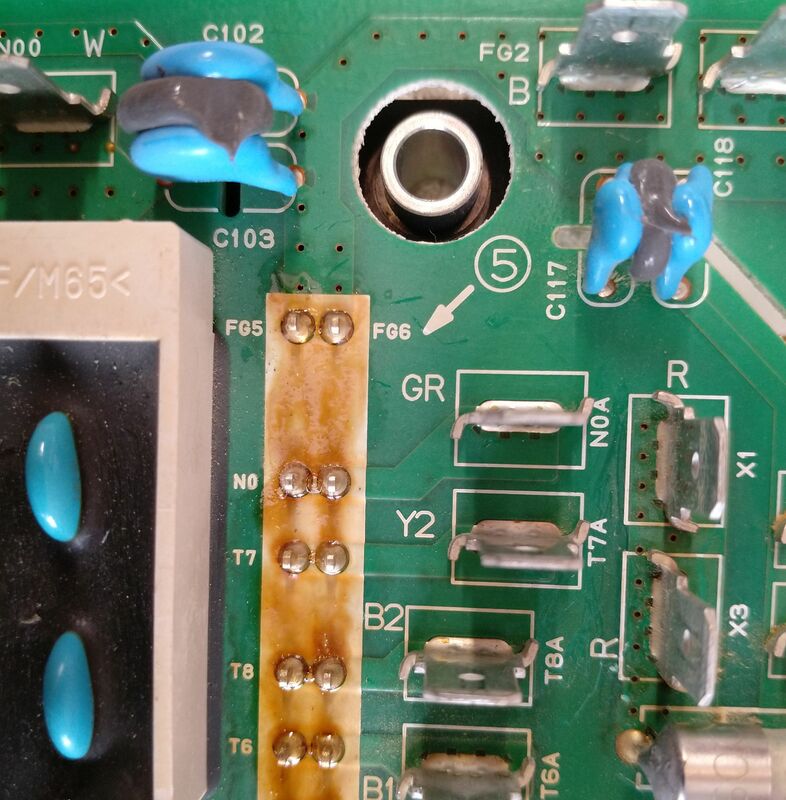 So you may well have high resistance or otherwise bad pre-charge resistors, and that might be because of a short circuit on the other side of the pre-charge resistors. There are two small blue capacitors, one outlined in red. The other one is unfortunately hidden by a connector. These often blow, and are a major cause of iMiev charger failures. 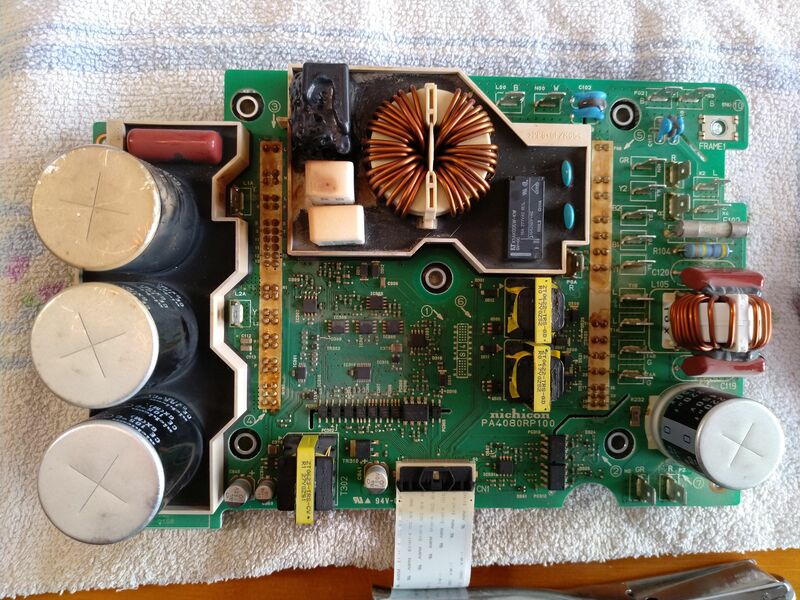 So please check the other blue capacitor, and if possible check that they aren't shorted. (Usually they'll blow to smithereens if they do short, however). Please follow the instructions in the first few pages of this topic, and see where that gets you. Kiev has summarised a lot of good information there. Howdy Greybeard, those are some great photos you have posted--such high resolution that we could trace the circuits if needed. 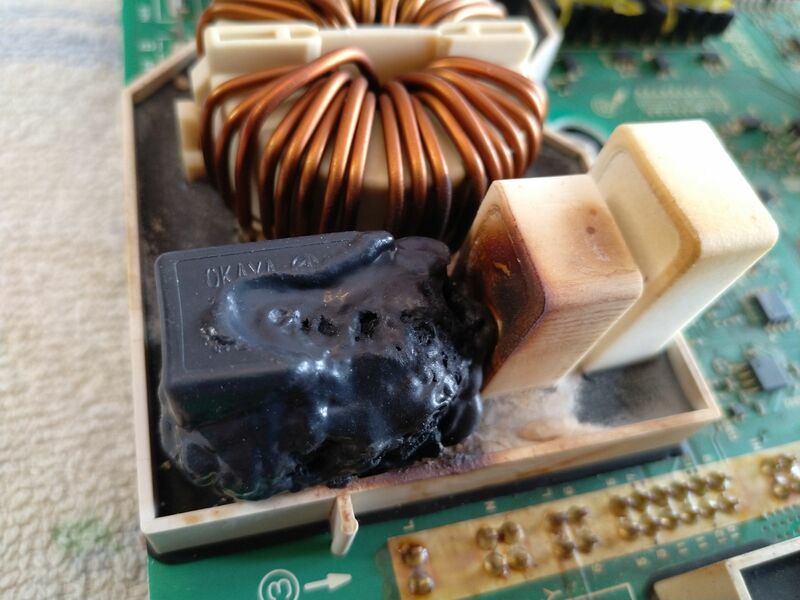 That black charred device is an AC filter capacitor also known as a Class X2 safety capacitor, which designates the rating for surge and overvoltage protection. Evidently it did it's job and hopefully saved the rest of your box from damage. i think that's the first one of those that we have seen fail. Usually they fail shorted and the result is fire and burnage such as you found. That exact same part is found in your first picture above of the little external filter box. 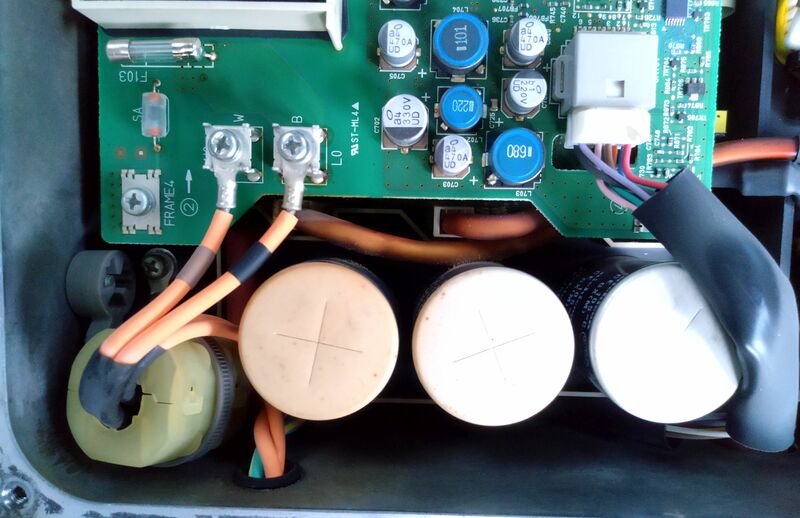 Any big surge would have to travel thru the AC line filter of the top box before it enters the main OBC box, so i think Coulomb's idea about heating from the big white precharge resistor standing next to the capacitor is a likely culprit. 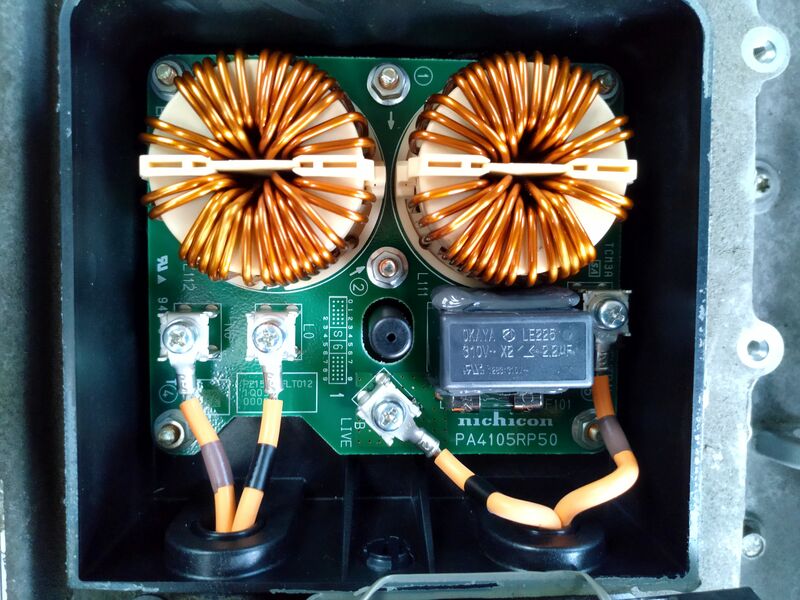 That could occur if power to the coil of the input AC relay were to be interrupted, which could occur if the 12V Aux battery were old, weak or worn out. So what is the condition of your 12V Aux battery? Is it the original that came with the car, is it old or fresh, etc.? Open the access cover of the MCU located next to the OBC, and see if your 20A fuse is blown? That supplies power to the DCDC converter which recharges the 12V aux battery. My device is only marked LE225 but has the 310 voltage marking, so it's not clear which sheet applies. That entire bottom board and the waffle plate soldered underneath it can be removed from the housing by unscrewing the black standoffs and screws holding it down. Then from the bottom side you can access at least one of the solder terminals for the capacitor. Maybe the leads stick up on the top side such that you could solder to those after removing all the black char material. You could try that approach first, then remove the board if top-soldering won't work. 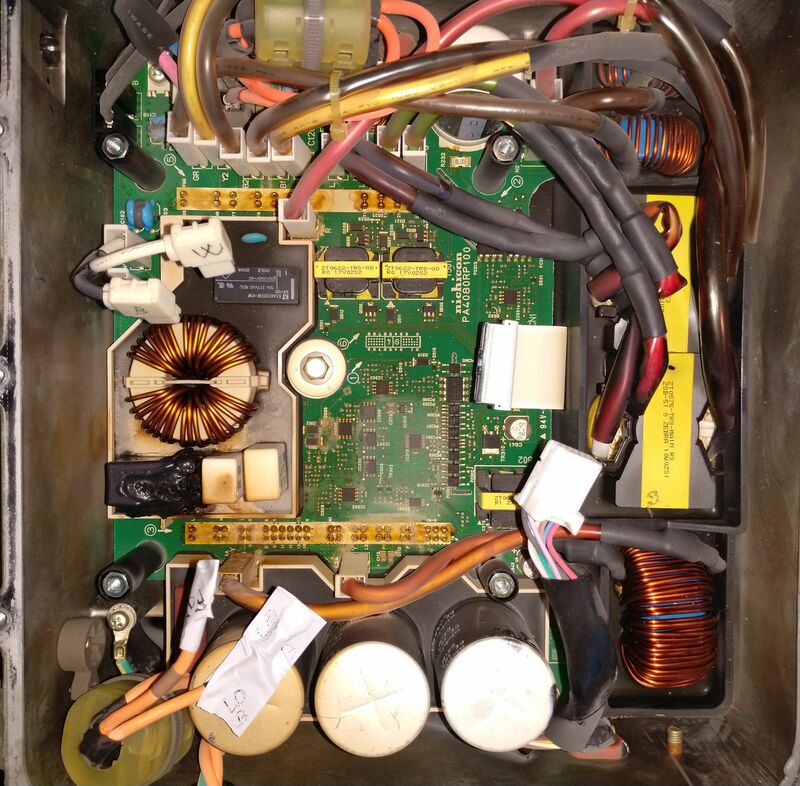 Hopefully you could get solder on the capacitor terminal that lies above the aluminum waffle plate that is soldered to the bottom side of the big bottom board. The waffle plate is covered in white gooey thermal compound that you don't want to touch if possible, and don't get it in your eyes. kiev wrote: ...So what is the condition of your 12V Aux battery? Is it the original that came with the car, is it old or fresh, etc.?. 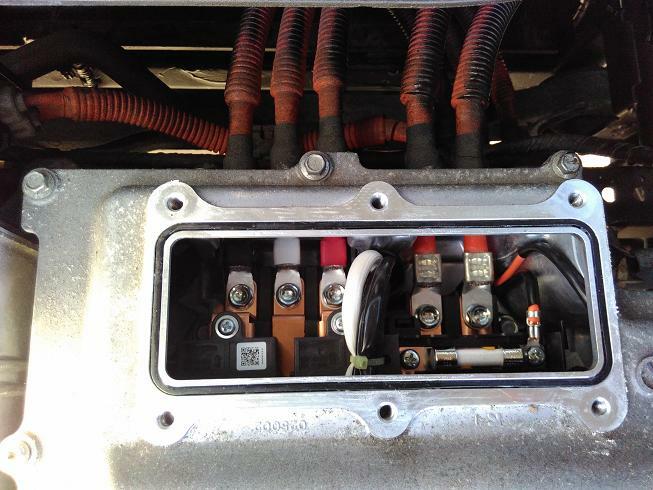 The original 12V battery ('2011) was changed only two months ago, after some strange behavior. kiev wrote: Open the access cover of the MCU located next to the OBC, and see if your 20A fuse is blown? That supplies power to the DCDC converter which recharges the 12V aux battery. I think "OBC" is the On Board Charger, the big box that I have open, but ¿what is (and where is) the MCU? but ¿what is (and where is) the MCU? It's the next big box to the right, the Motor Control Unit. coulomb wrote: It's the next big box to the right, the Motor Control Unit. i suspect the OEM battery may have been involved in this failure. 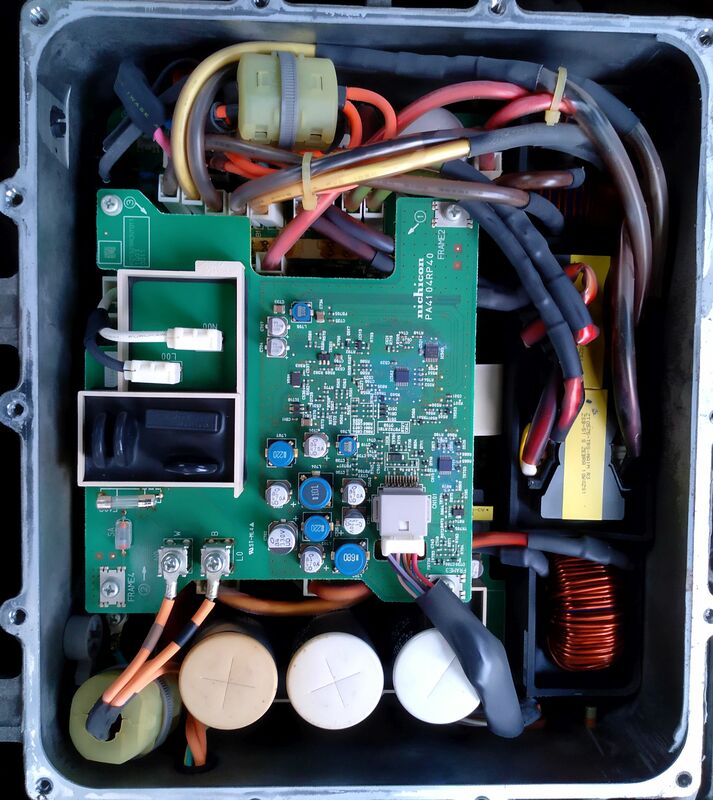 Good news about the fuse, your damage may be contained to components within the potted doghouse area with the plastic fence: AC relay, precharge resistors, filter coil, filter capacitor, snubber caps. The black rubber potting material in the doghouse can be removed using a wooden spudger tool--like a bamboo chopstick whittled to a flat screwdriver blade, and use it like a scraper. Well, finally I have been able to put in some time and I have removed the board off the OBC. I do not see any more visible damage. The fuse is OK. The small capacitors seem OK, I don't see explosions or similar. White thermal compound on the bottom was cleaned/retired. No worry on the pictures, sometimes it helps to see the details. 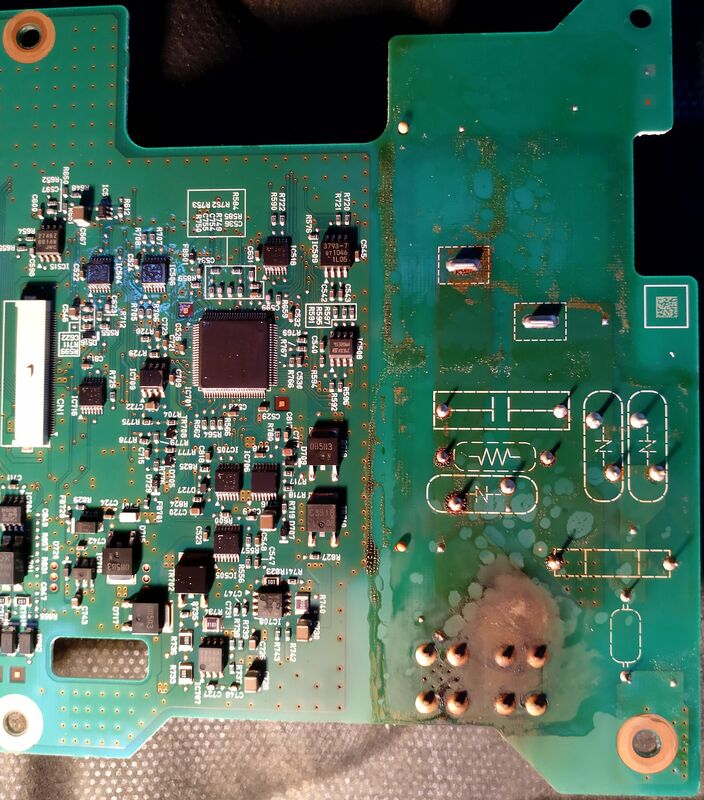 If you wanted to clean up the board for inspection, the solder and smoky residue on the board and big caps, etc can be wiped off and cleaned with alcohol on a rag or small stiff brush. The plastic sleeve on the large caps is a PVC tubing that shrinks when heated during manufacturing, but they have obviously had some heat exposure in your box that has caused additional shrinkage. 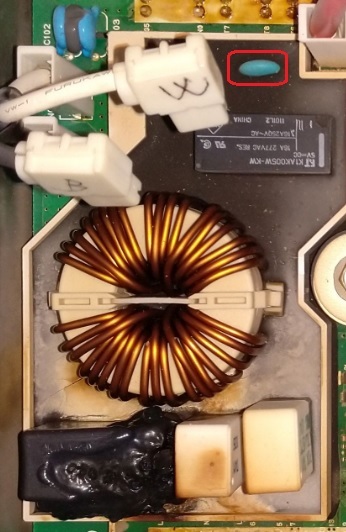 The question to answer is whether the safety cap failed on its own, or was the AC relay circuit involved in over-heating the big white ceramic resistor? Do you have any electronics repair shops around that have de-soldering equipment? It may be necessary to remove the waffle plate for troubleshooting and repair of your board. I'm having big trouble desoldering the waffle plate, it gives the impression that it dissipates so much heat that it can't melt the tin. Finally, trying to remove the waffle plate I damaged the main board. I start the search for another charger from a wrecked car. I'm tempted to re-weld the waffle plate and try to change the burst capacitor from above. 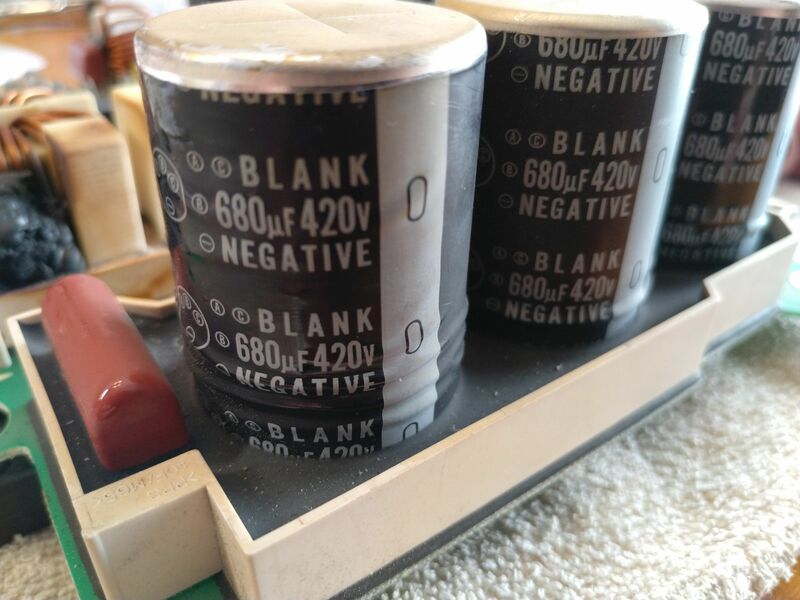 Although I can not find the "OKAYA LE 225 FX", but find in stock "LE 225", "LE 225 ROHS" and "LE 225 MX"
If I can not remove the plate and access it below, and I do not see other faults, it might be interesting to try changing the capacitor from above. Last edited by Barbagris on Mon Feb 25, 2019 1:01 am, edited 1 time in total.